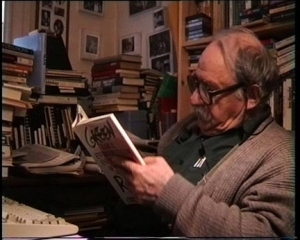 BOOKCHIN ON BOOKCHIN is an independent feature-length documentary about the life and times of American political thinker Murray Bookchin, who made history as the founder of the social ecology movement. Our aim is to make a film that deeply explores the influences and experiences that have helped shape one of the most unique and distinctive voices in modern political thinking. The documentary will explore the development of Murray's politics through his personal experiences, drawing off hours and hours of filming. We were granted unparalleled access to Bookchin, including exclusive interview footage at his home in Vermont and his final public appearance in Montreal. Murray was reticent to engage in anything that smacked of the personality cult but his biography covers key points in the development of radical politics and sets in context the "Social Ecology" of his later life. We are in the process of making the film, but need your help in order to complete it. Thanks for visiting our page and we hope you enjoy what you find! We are currently crowd source funding this project. Please support this project by making a donation, no matter how small, visit the Bookchin on Bookchin indiegogo site. You can browse through our selection of titles on Spectacle's A-store and, if you decide to buy a book by or about Murray Bookchin, by simply clicking through the links (instead of doing so on the Amazon homepage), you will grant our independent company a 10% on that sale. No extra fees, same great price and free delivery as on Amazon, just...with a little help for your friends. Why not support our Bookchin on Bookchin project?